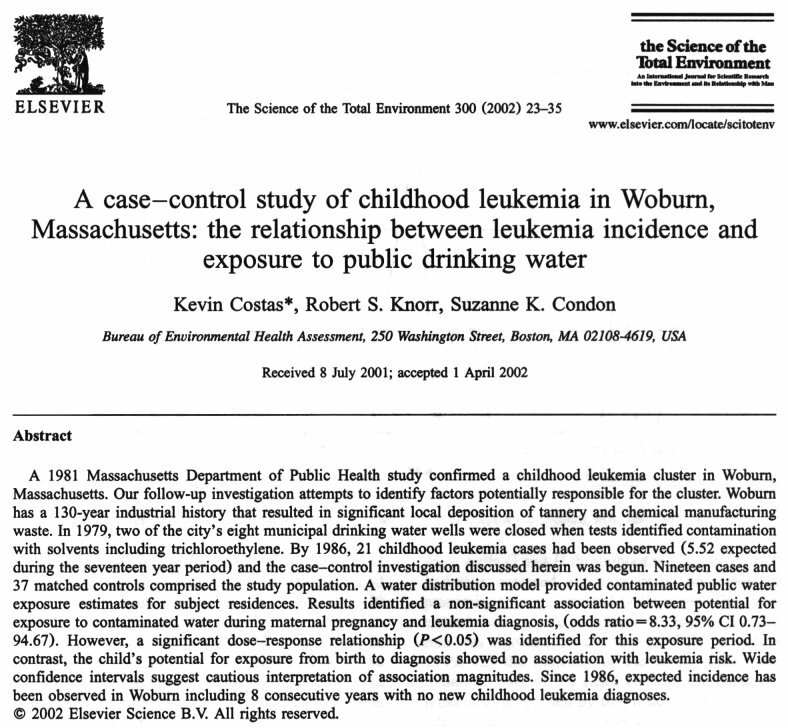 The public health studies, which focused on the Woburn leukemia clusters, were the earliest publications that brought attention to the health problems in Woburn. Eventually, a 1997 Massachusetts Department of Health study validated the plaintiffs case, statistically supporting the argument that there was an anomalously high occurrence of childhood leukemia in the community. Although the health studies performed and published before the trial were produced by entities that were credible and highly experienced, the defense spent considerable time and effort presenting shortcomings of these studies. 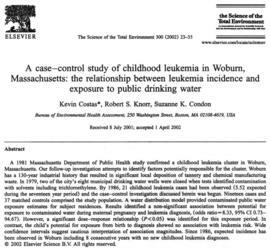 Listed below are links to copies of several significant studies regarding the health problems in Woburn. The first studies was conducted between 1979 and 1981 by the Massachusetts Department of Health. The subsequent studies by the Harvard School of Public Health and the U.S. Agency for Toxic Substances and Disease Registry (ATSDR) attempted to further define the relation between environmental factors and the resulting types of cancer and other diseases in Woburn. Keep in mind that only the first Massachusetts Department of Health study and the Harvard School of Public Health study were completed before the Woburn Toxic Trial and were available for inclusion in trial testimony. Click here to see information regarding the Harvard study. Since the toxic trial, medical science has made significant strides in understanding the many aspects of cancer. However, specific links between environmental exposure and the onset of cancer still remain problematic in definition. During the trial the plaintiffs try to use the health studies as conclusive evidence showing a relationship between the chlorinated solvents in the drinking water and the leukemia clusters in Woburn. The defense, on the other hand, use the vagueness in scientific knowledge regarding the connection between environment and cancer to cast a shadow of doubt regarding the guilt of the defendants. Many of the same issues during discovery and the trial are relevant today in arguments regarding cause and effect of cancer. When the initial study was released by the Massachusetts Department of Health, it seemed to make an overwhelming statement regarding the link between contaminated groundwater and the cancer clusters in Woburn. However, the defense closely scrutinized the document and focused on the weaknesses of the scientific arguments used to conclude the cause-and-effect between drinking water and cancer. During depositions Jerome Fachter asked each witness if they ate peanut butter, ate bacon, used or was in contact with various types of normal household chemicals, and so on to establish that multiple sources of the cancer are present in Woburn residents everyday lives. The connection between peanut butter, bacon and other chemicals were shown by other Center for Disease Control studies to be linked with cancers. Part of the plaintiffs task is to show a direct connection between trichloroethylene, ingestion by drinking water and the cancer clusters.